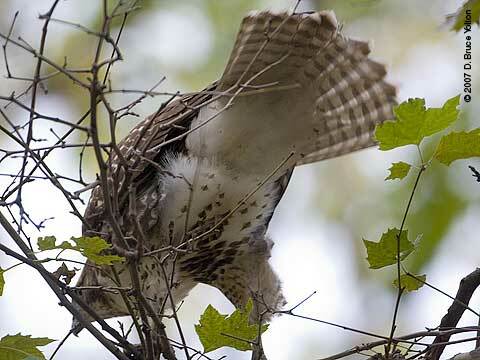 While there were reports of Eastern Screech-Owls sightings over the last month and the sighting of a Saw-whet last weekend, today was the first day I saw or heard owls first-hand. 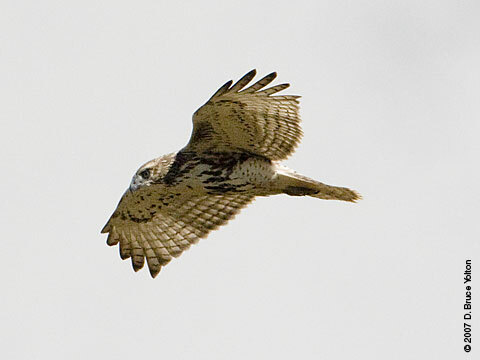 I saw my first owl of the fall, a Northern Saw-whet Owl. 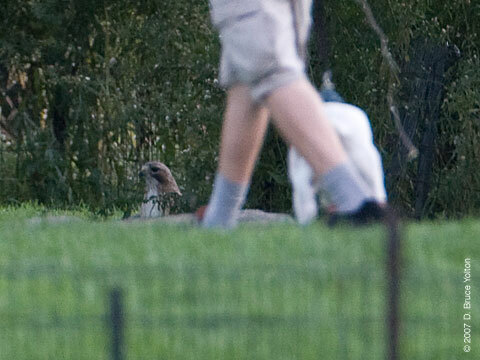 Plus while leaving the park at dusk, I heard the trill call of an Eastern Screech-Owl. 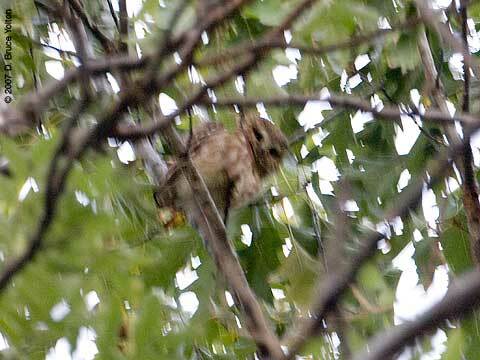 A blurry picture of the Northern Saw-Whet Owl. 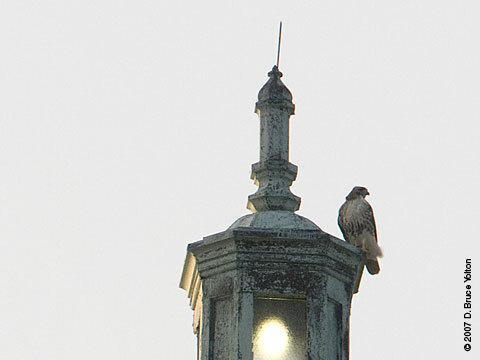 I was able to see both Pale Male and Lola on late Sunday afternoon. 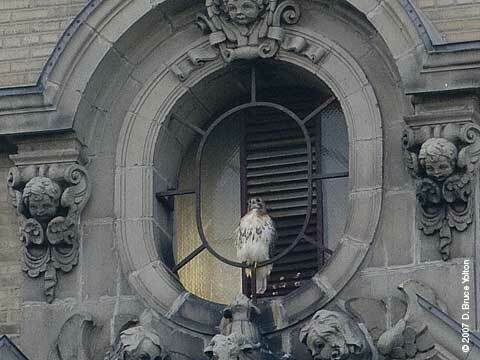 Lola on the northeast tower of the Beresford. 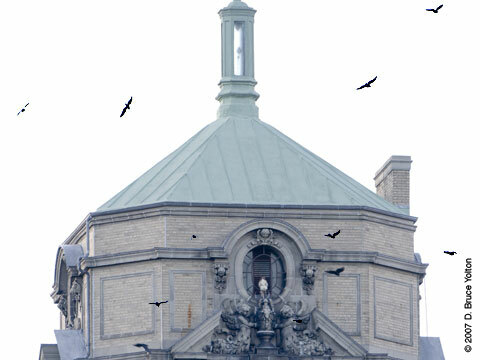 American Crows making a racket, but not directly attacking Lola. 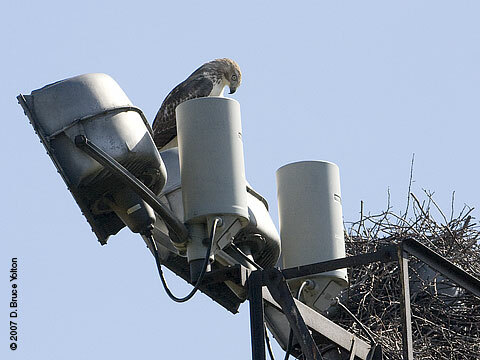 Pale Male on a MET security camera. 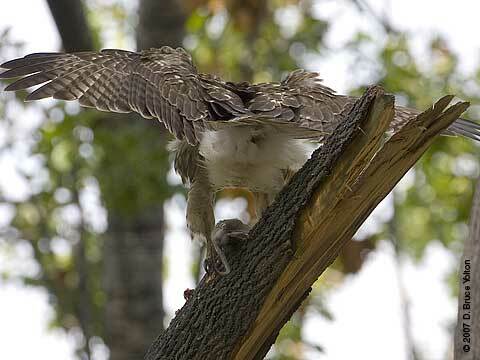 Pale Male on his favorite Turtle Pond tree. 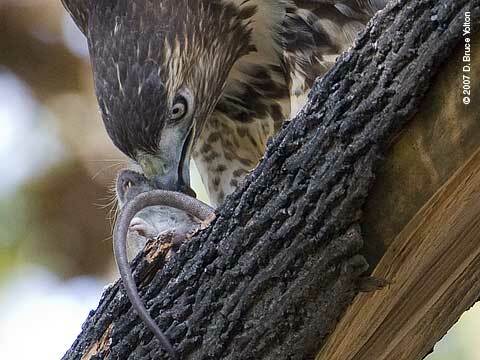 but returned to Turtle Pond to catch a rodent. 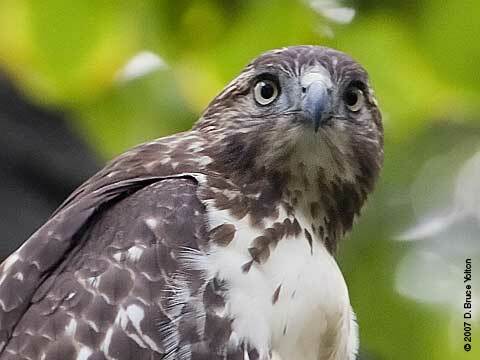 He must have incredible vision. 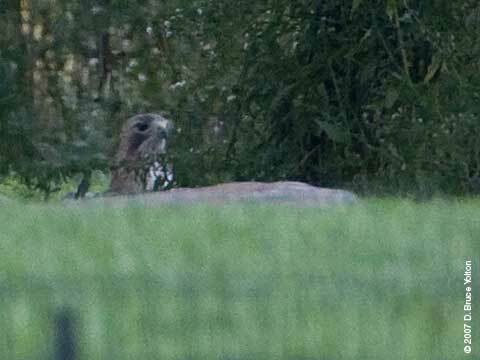 He hunted from about 150 yards. 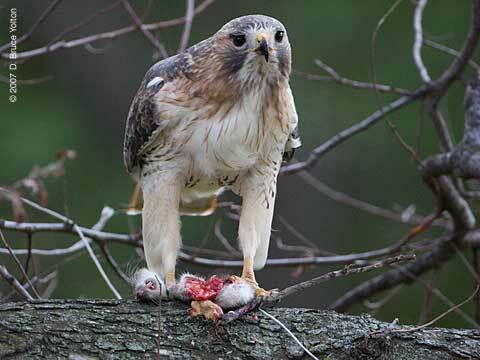 Then he went up into a tree for his dinner. 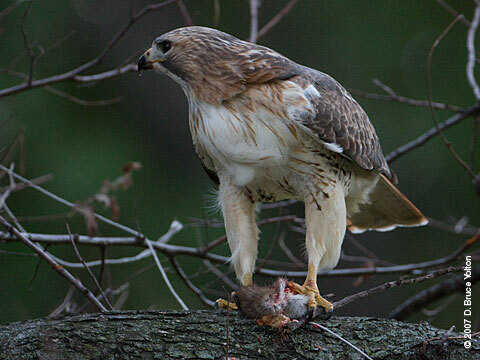 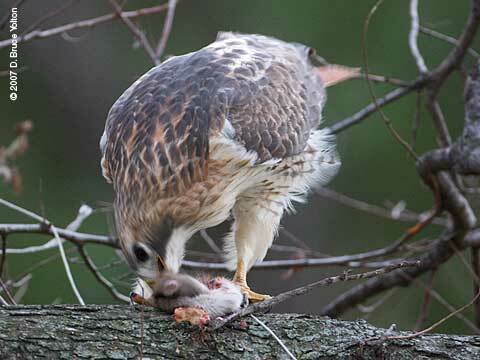 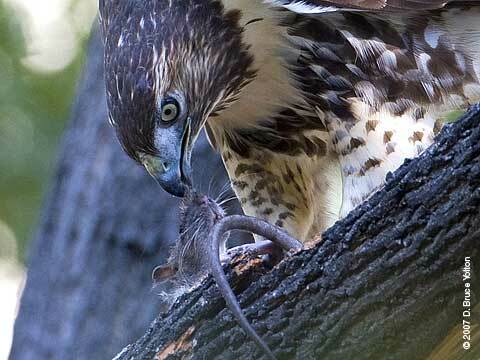 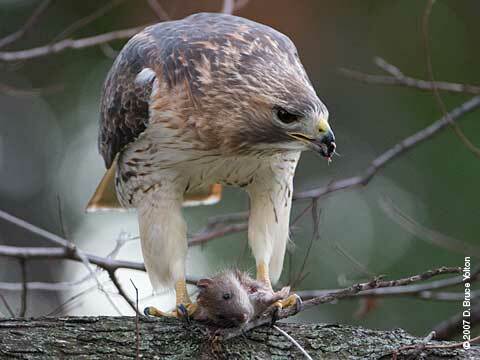 After he was done eating, he cached half of the rat on a Great Lawn tree. 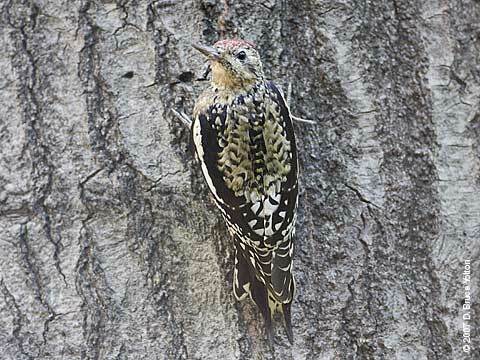 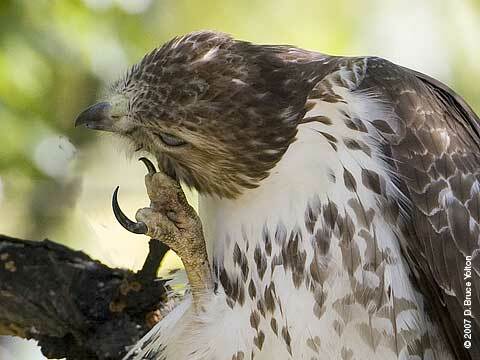 He then cleaned his beak on the bark of this tree and flew north for the evening, skipping his usual sleeping tree. 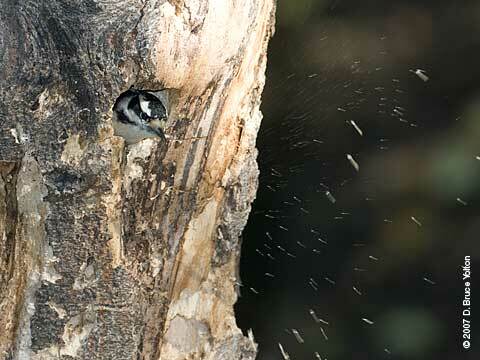 A Downy Woodpecker was busy making a cavity on Sunday, near Triplets Bridge. 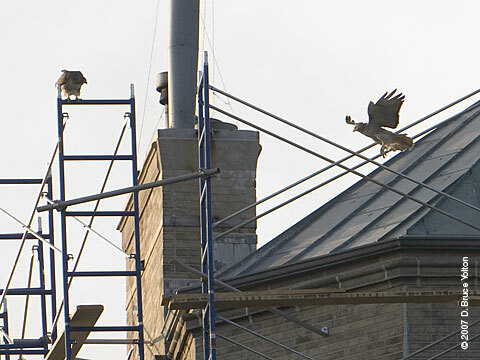 That's sawdust being ejected from the nest on the right. 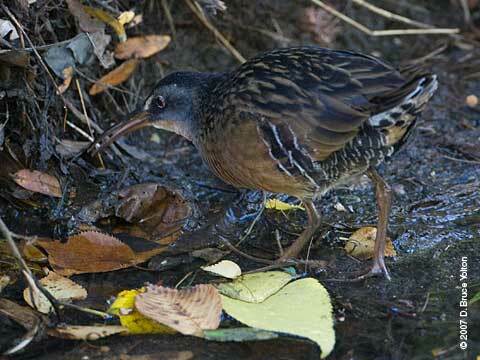 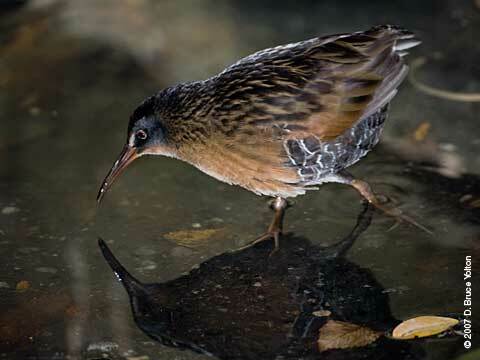 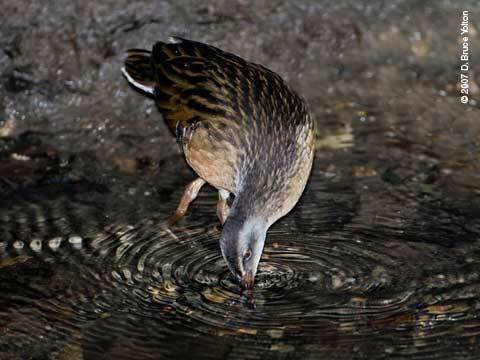 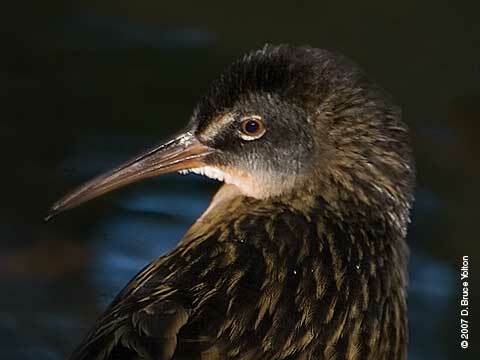 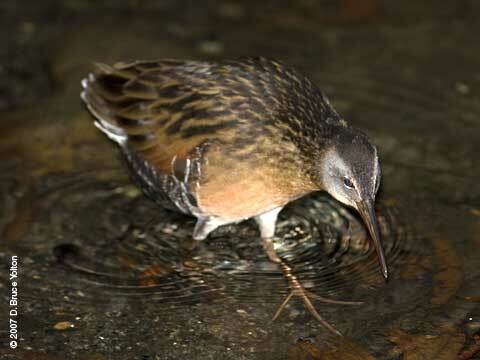 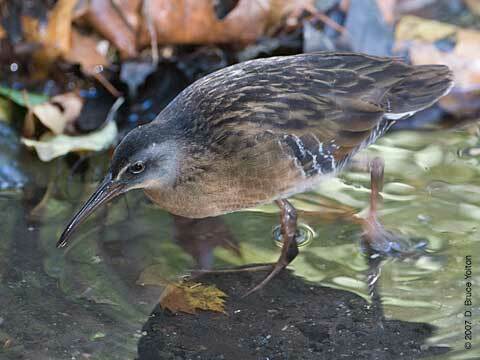 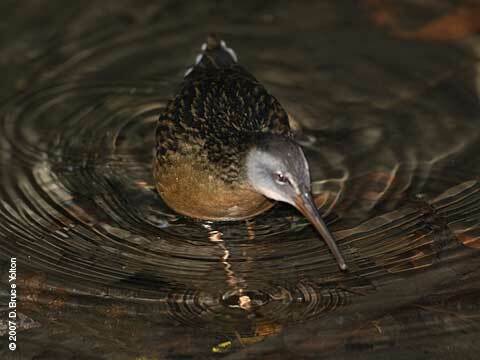 A Virginia Rail, which may be the same bird that was released into the park earlier this month by a rehabber, was out in the open on Sunday in the stream between Balcony Bridge and Triplets Bridge. 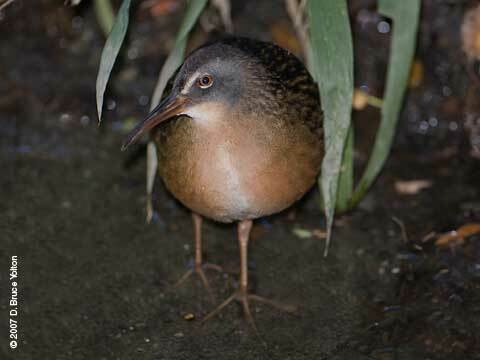 The reeds where the bird had been hiding, were removed last week as part of the renovations of the Lake. 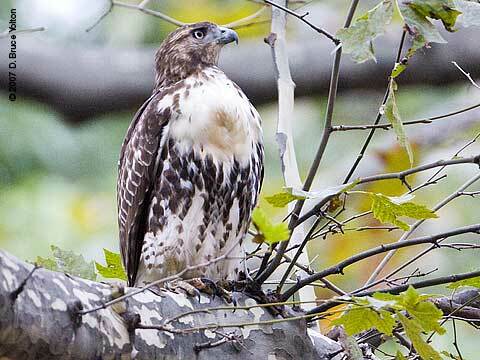 On a gray day, that dried out late in the afternoon, I caught up with our young Washington Square hawk in the eastern side of the park. 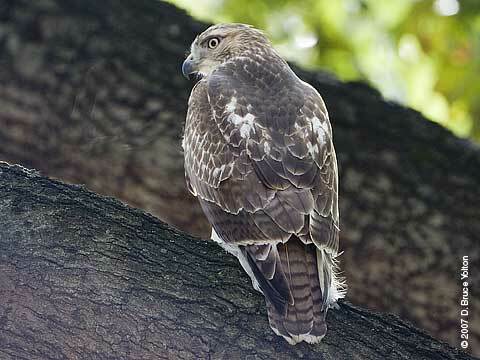 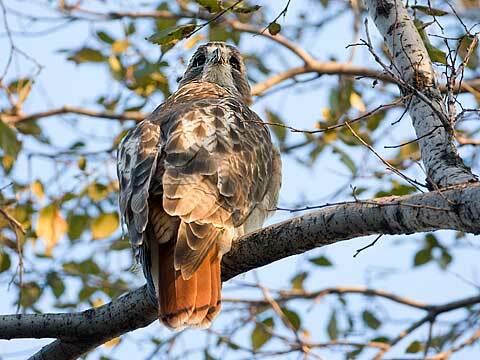 The hawk hung out for awhile, moved around a bit, made one hunting attempt, and then settled down for the night on a high branch of a mature London Plane tree. 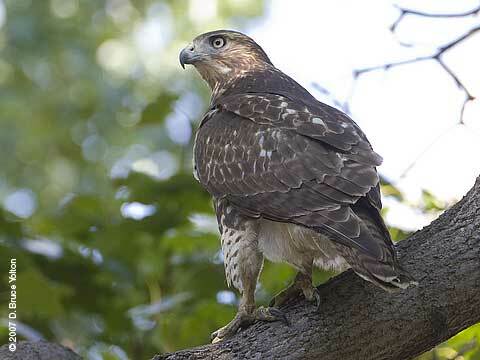 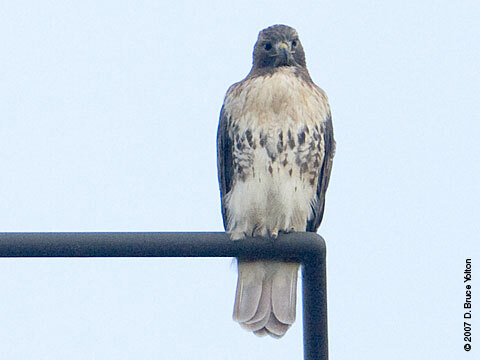 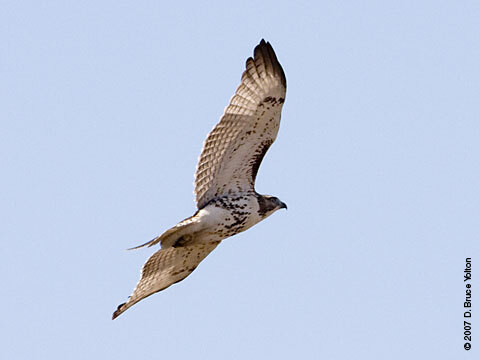 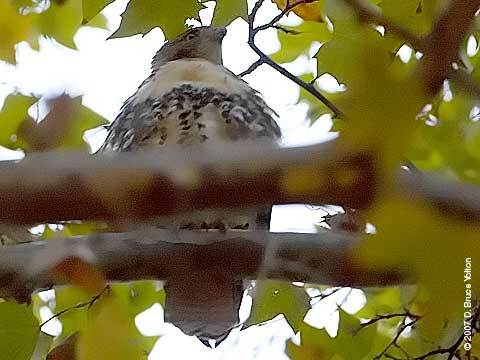 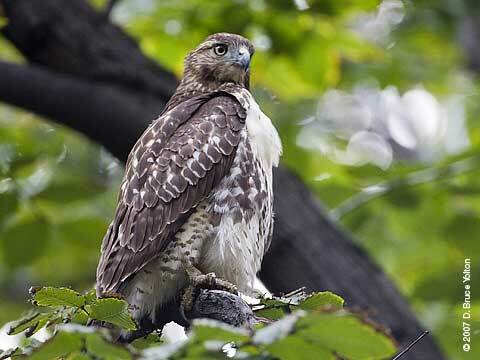 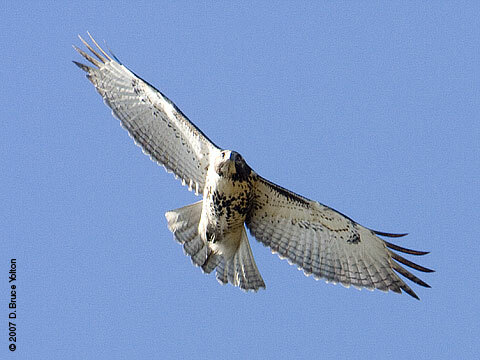 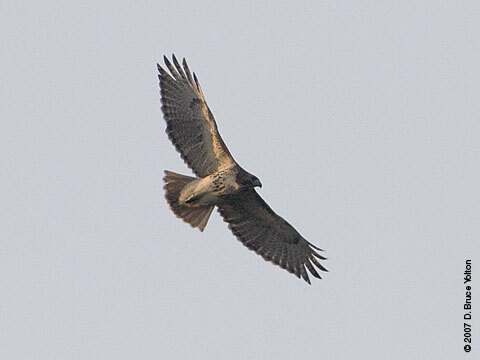 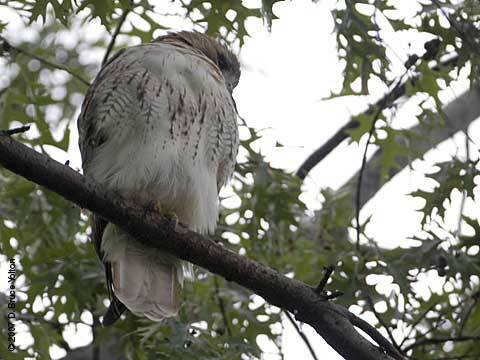 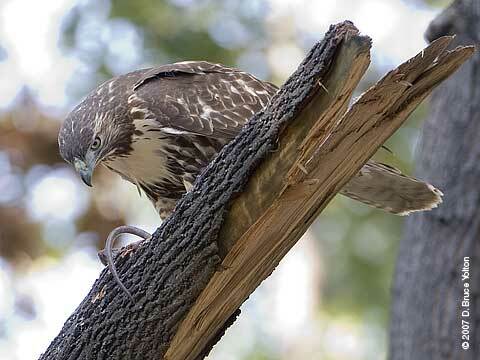 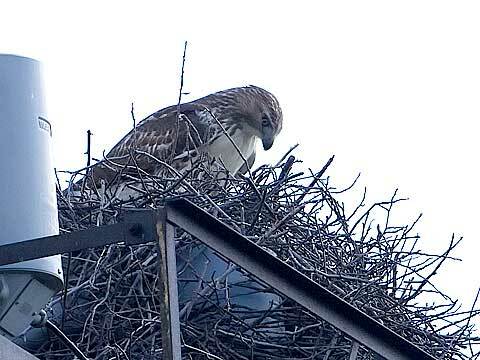 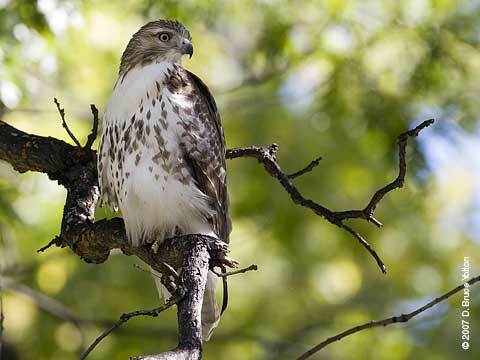 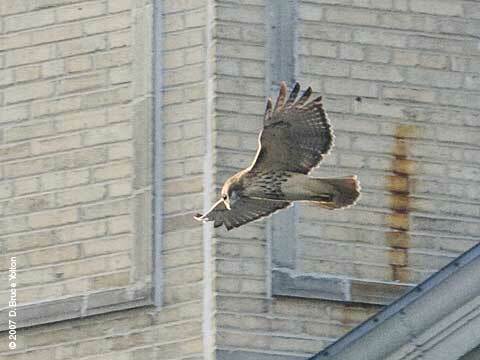 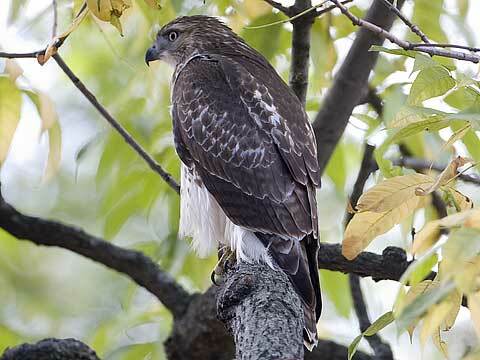 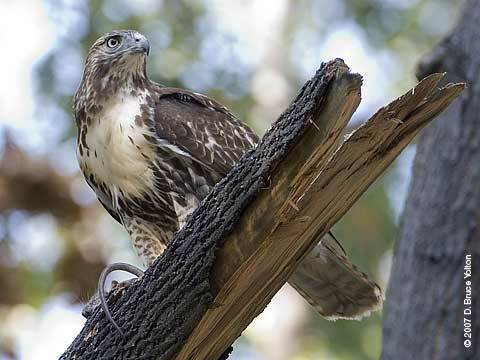 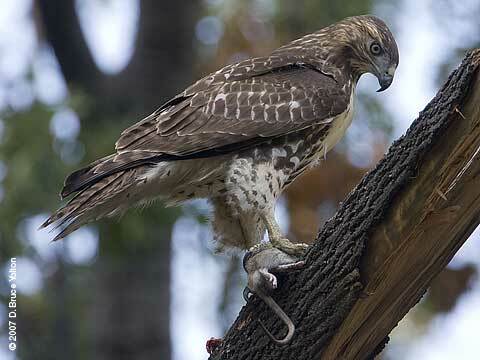 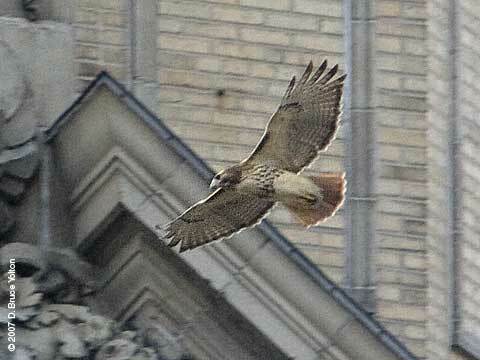 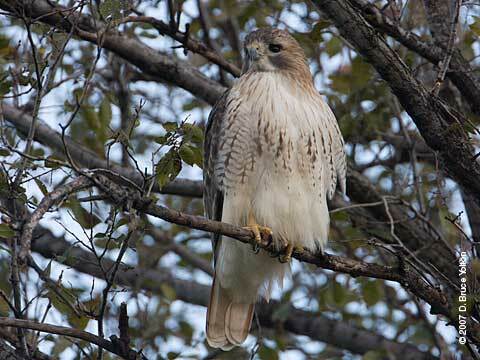 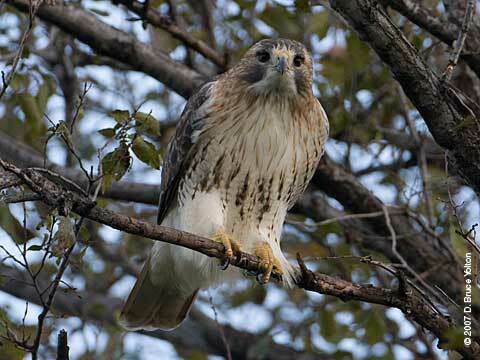 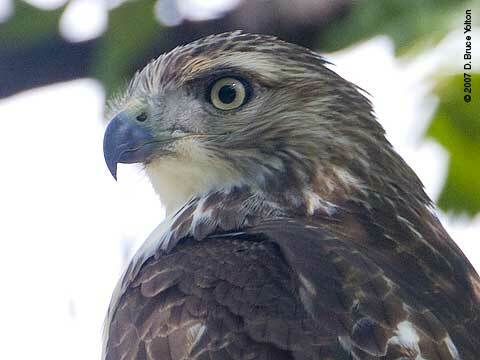 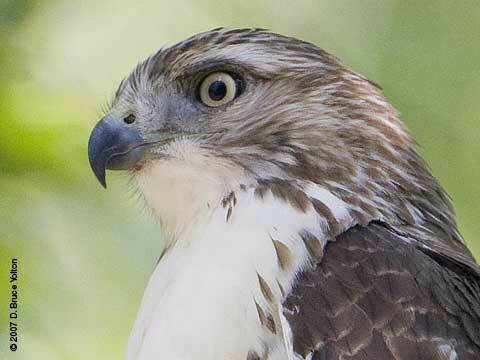 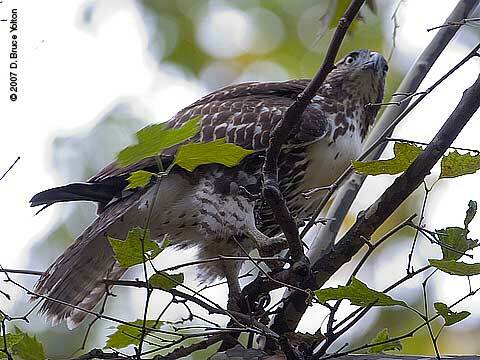 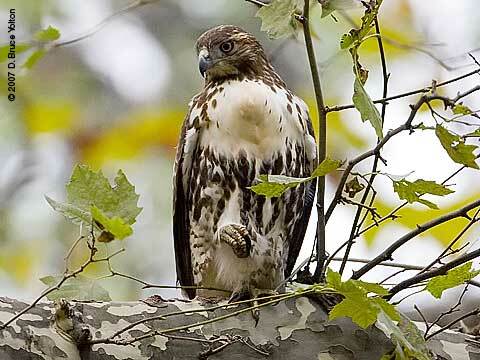 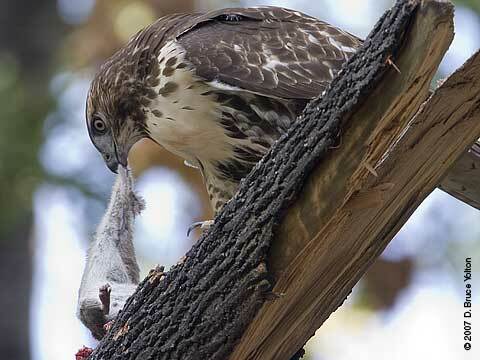 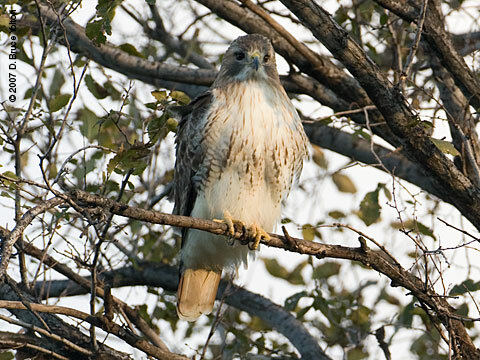 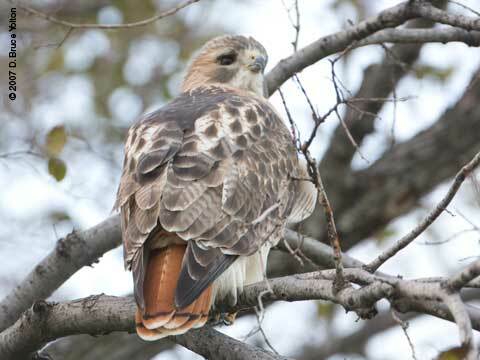 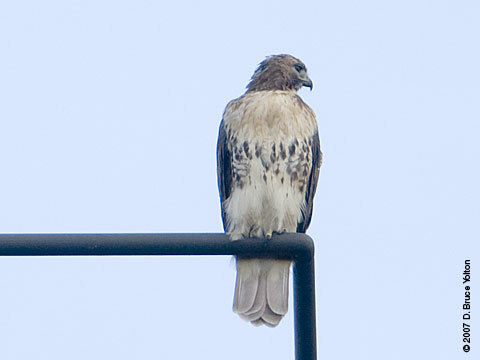 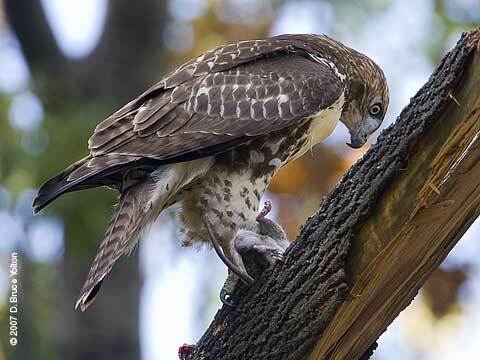 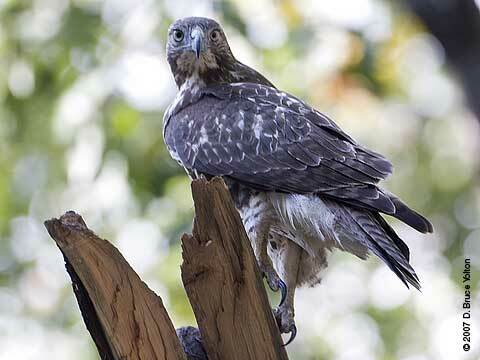 For about three weeks, Washington Square has been host to a First Year Red-tailed Hawk. 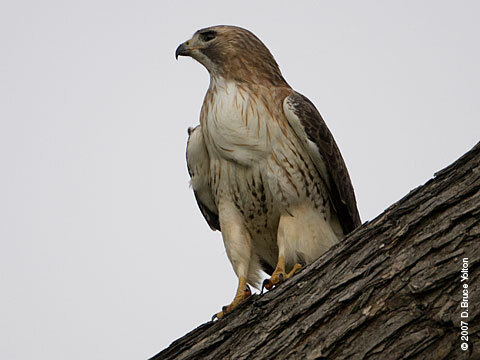 Today, I saw the hawk for the first time. 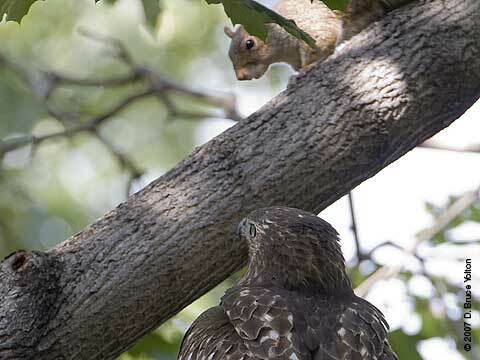 It was feeding on a rodent and then had a stand off with a squirrel. 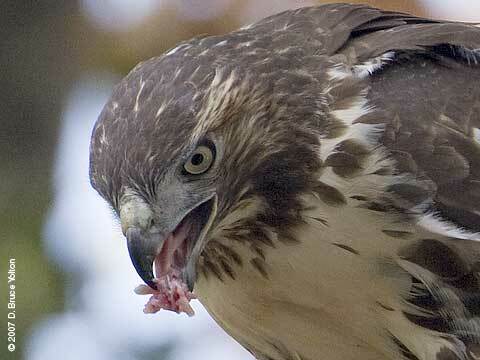 This post does have some graphic pictures. 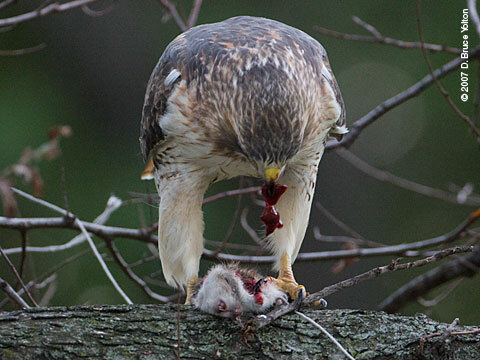 If you're squeamish, you might want to skip to another post. 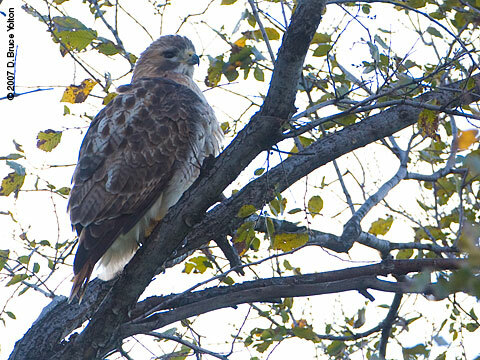 Sunday, I spent mid-day in Pelham Bay Park in the Bronx. 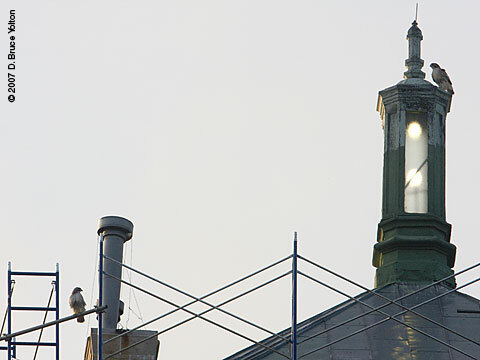 It's at the end of the 6 Subway Line, which is an easy but long ride from Manhattan. 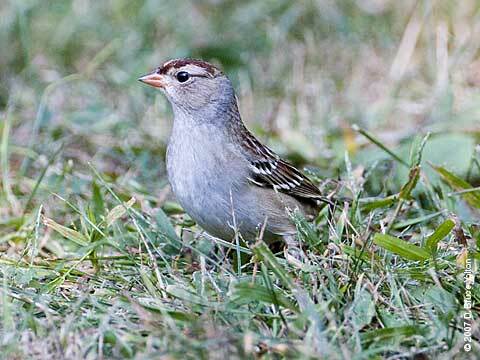 Long Island Sound basically ends at the park, which makes it a perfect magnet for birds migrating from New England. 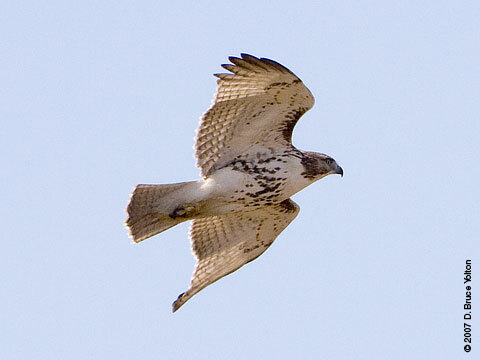 Once a year, the Urban Park Rangers lead a hawk watching tour of the landfill which is normally closed to visitors. 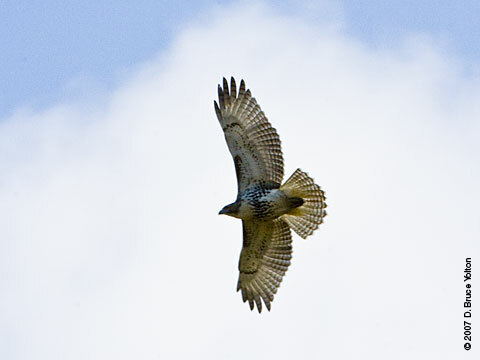 This year's tour ended up being a perfect day for hawk watching. The weather was nice, and the wind was steady and from a northwesterly direction. 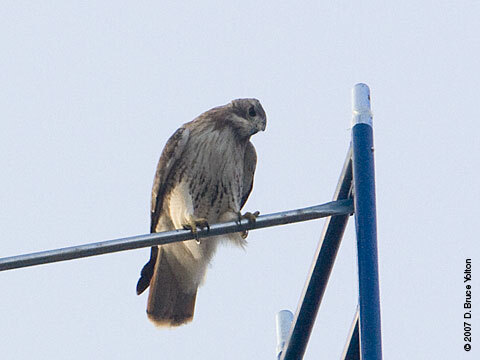 We ended up having hawks in view the entire time we were on the landfill, which is highly unusual. 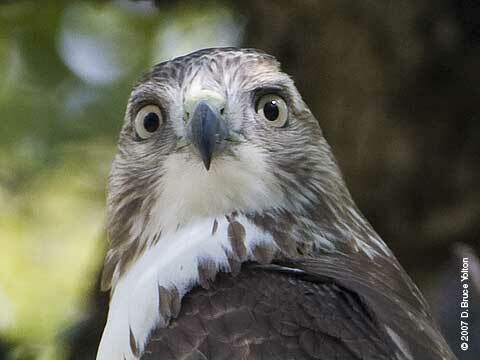 Needless to say, I had a great time. 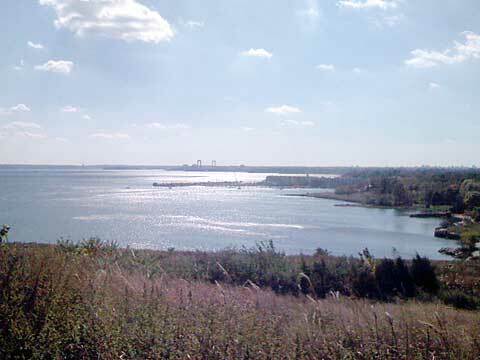 The view from the top of the Landfill. 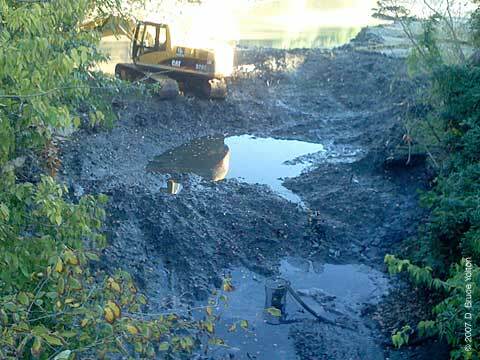 The landfill is a large hill. 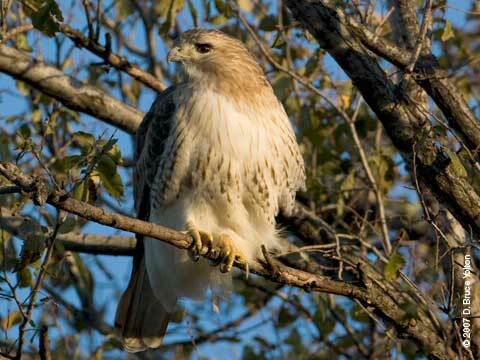 It is the highest point in the area giving us a great view, plus it creates updrafts for the hawks and falcons. 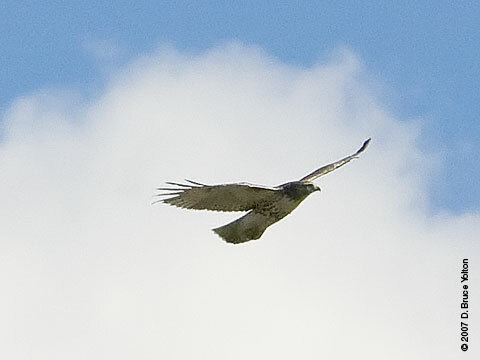 We ended up seeing many Red-tailed Hawks (seven were in the air at once), American Kestrels (at least four), Northern Harriers (at least two), Osprey (two, not photographed) and one possible Sharp-shinned hawk. 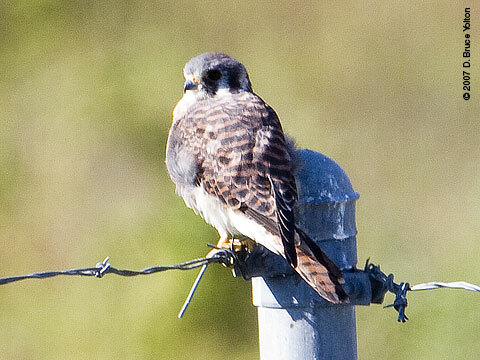 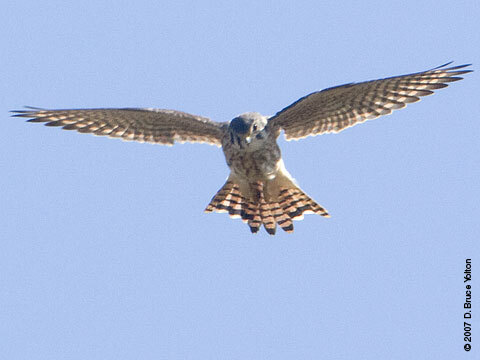 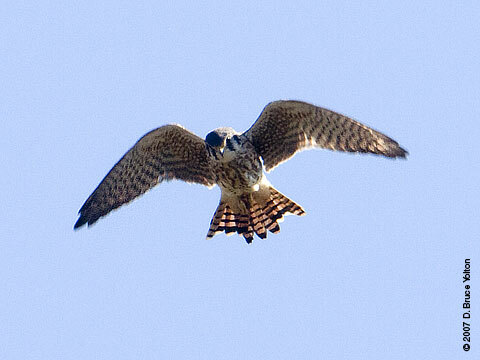 There were at least two American Kestrel pairs on the landfill. 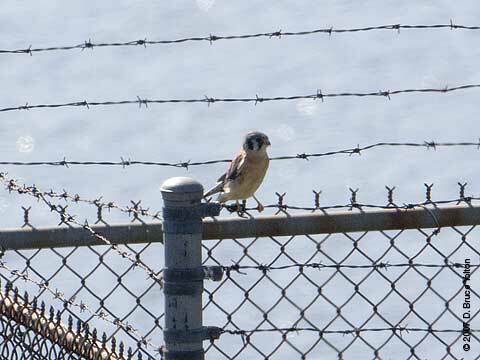 Two were seen on the barb-wire cages that surround the methane gas vents. 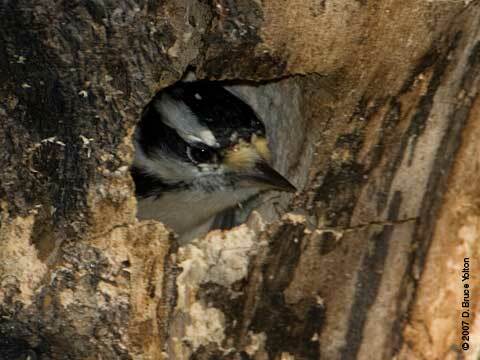 Needless to say the fences have large signs saying "No Smoking". 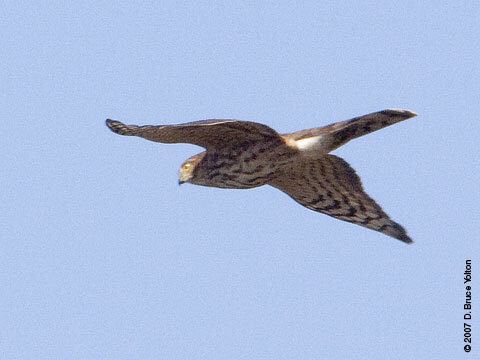 My guess is that this is an accipiter. 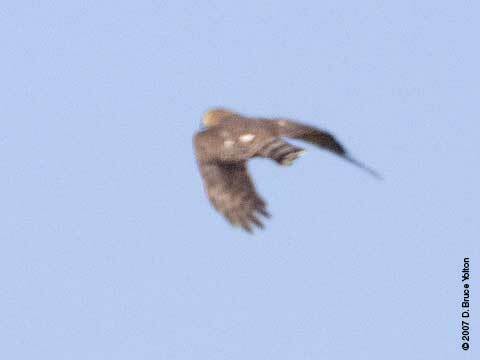 Based on the size, it is was likely to be a Sharp-shinned Hawk but this is only a guess. 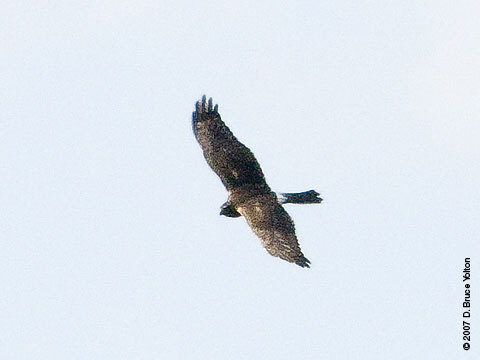 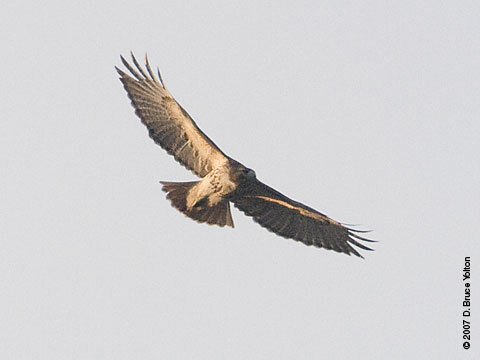 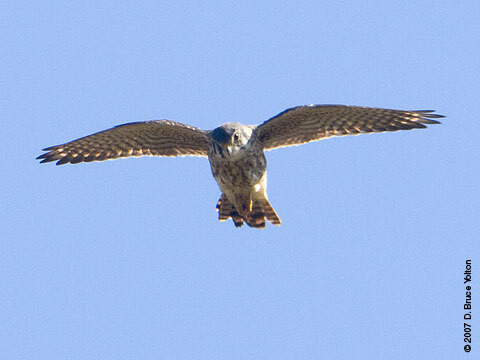 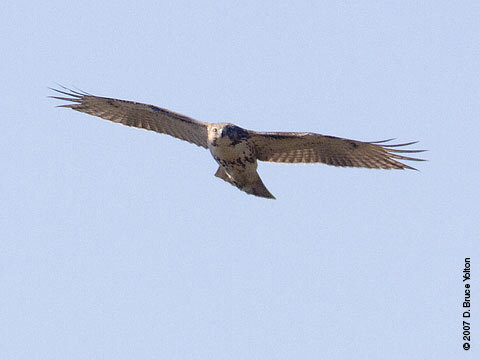 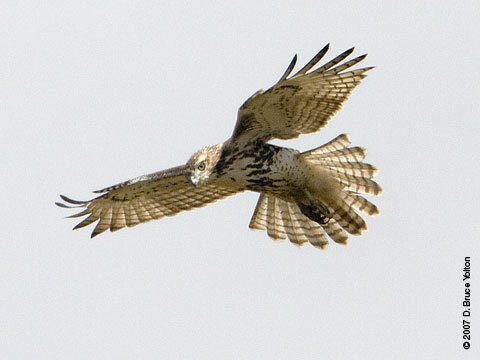 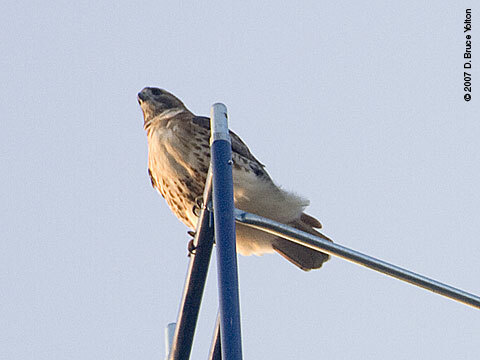 Reverse view of the same unidentified hawk. 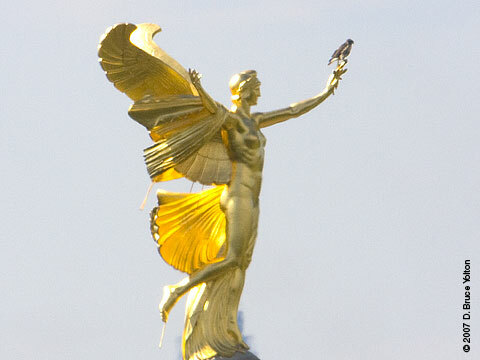 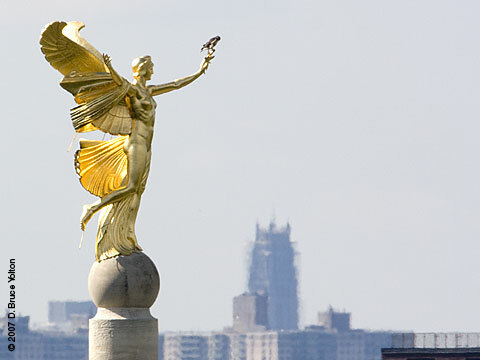 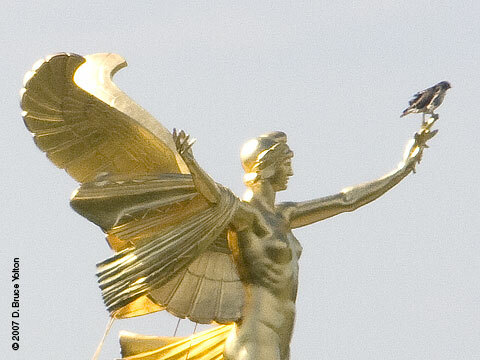 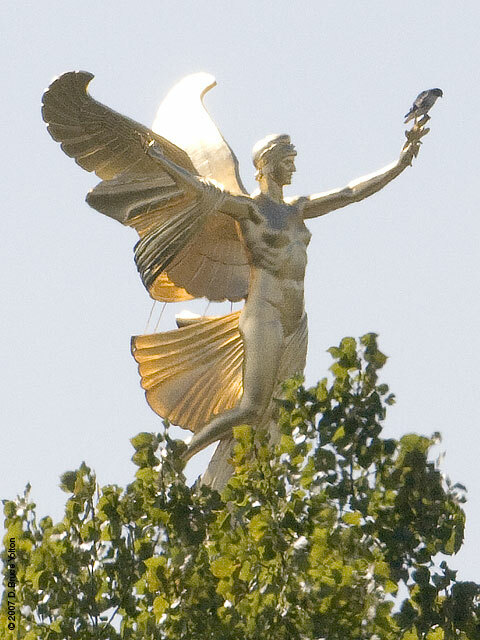 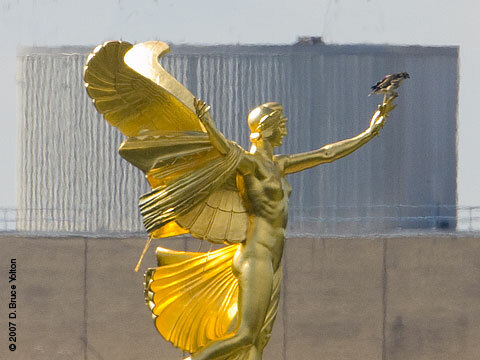 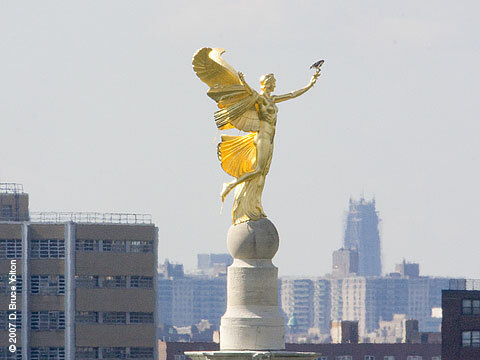 As we were leaving the landfill I commented how nice it would be if a hawk landed on the Bronx Victory Memorial. 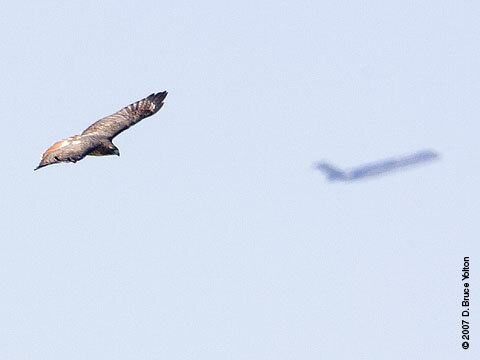 A few minutes later my wish came true! 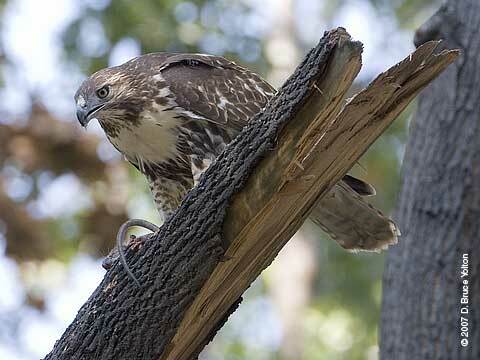 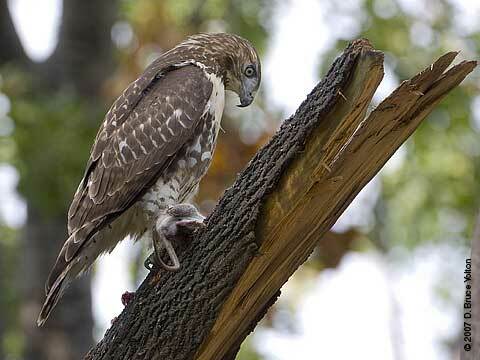 As we returned to the Ranger Station, a juvenile Red-tailed hawk landed on a tree 15 feet from the station. 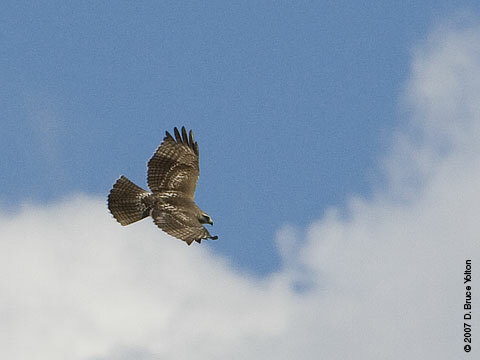 I was able to follow it for about an hour. 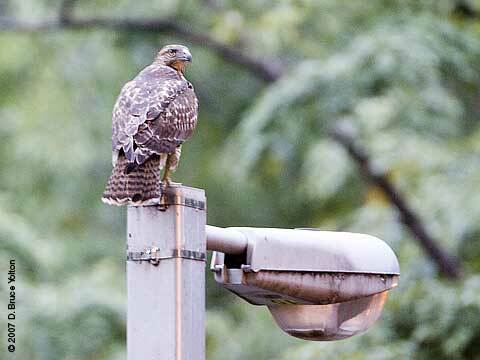 It hunted along the edge of the highway, in a playground, and on top of a stadium light. 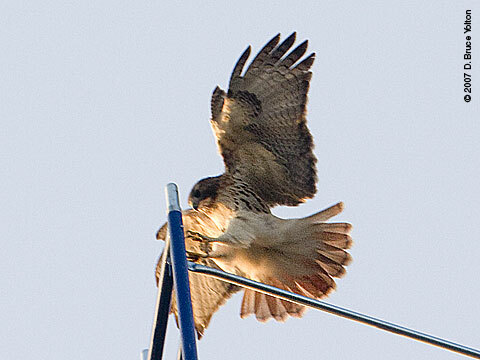 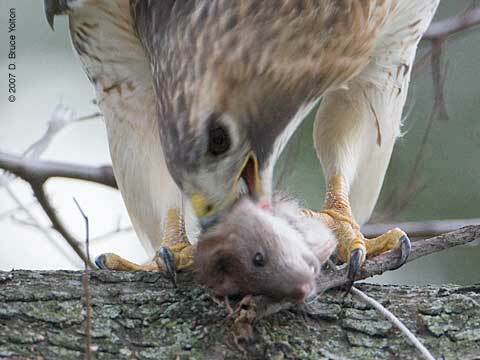 The hunting attempts weren't successful, but I think the young hawk was practicing rather than giving it the full effort. 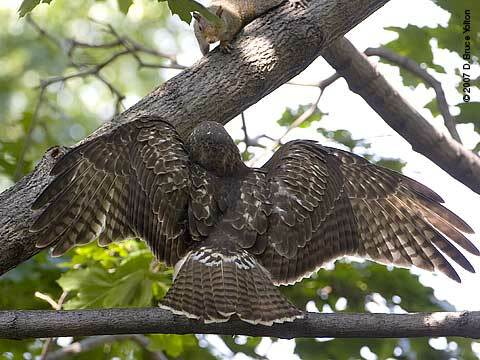 It moved from tree to tree making a hunting attempt each time. 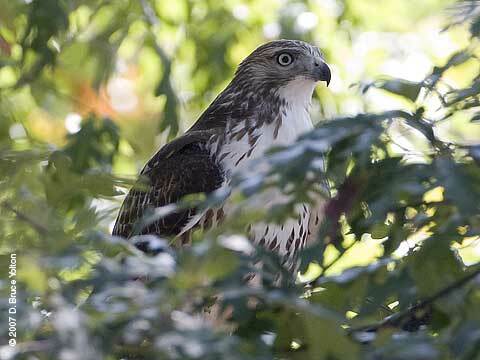 Here it is in a bush after trying for a mouse in a playground. 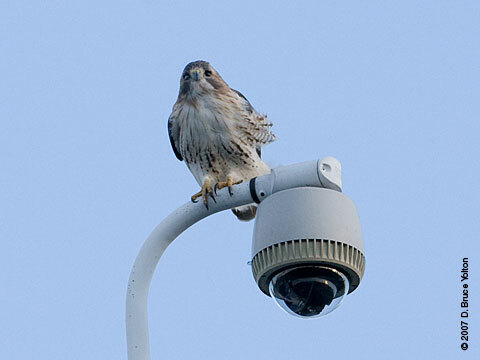 It then went after the Monk Parakeets of Pelham Bay Park, which use the stadium lights of the running track. 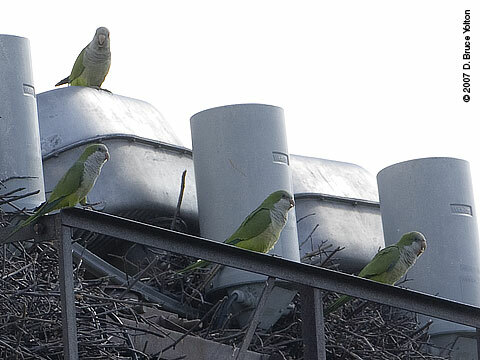 The Monk Parakeets were safely one stadium light tower away from the hawk. 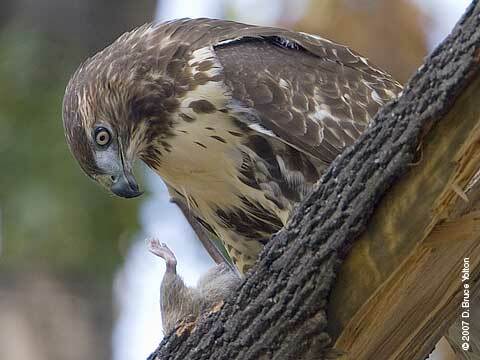 But they sure made a racket. 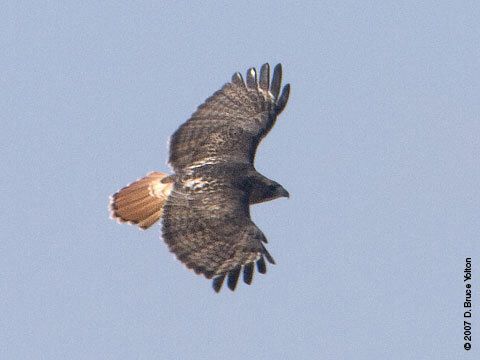 The hawk takes a few looks, moves around a bit and then flies away. 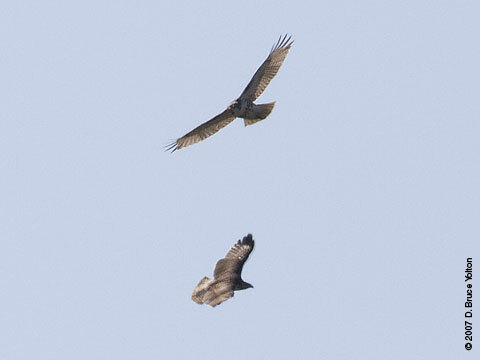 And within minutes is gone from view. 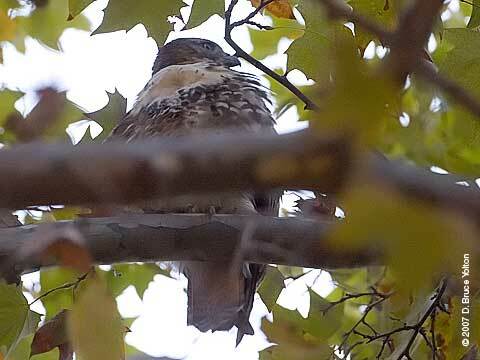 ...and Pale Male was in a new spot near his regular roosting tree. 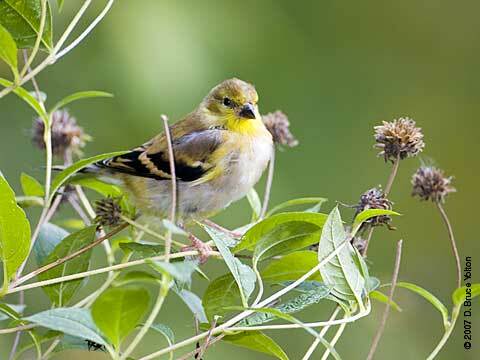 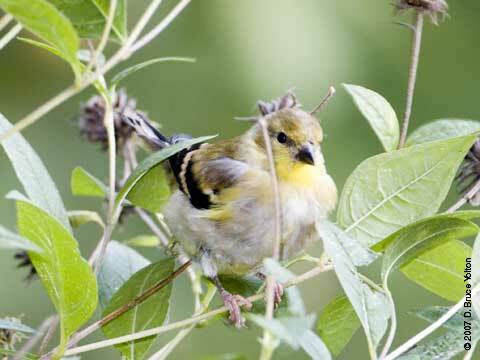 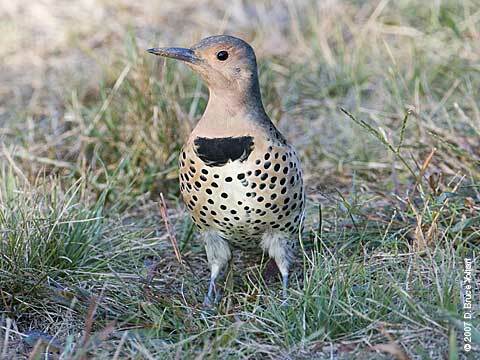 The tail-end of the Fall migration is in full swing. 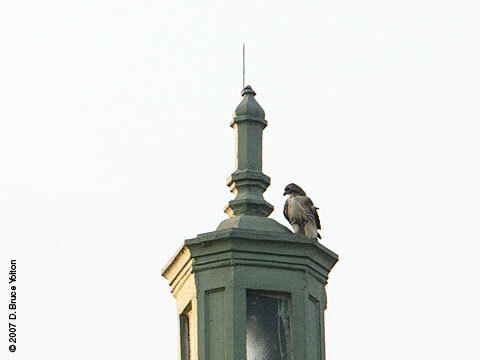 I only was in the park for a few hours, but got some good views of birds at Tanner's Spring, Sparrow Rock and the Great Lawn. 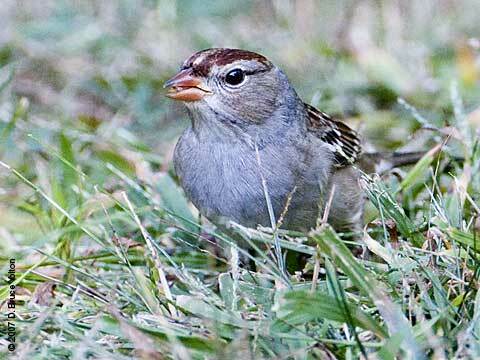 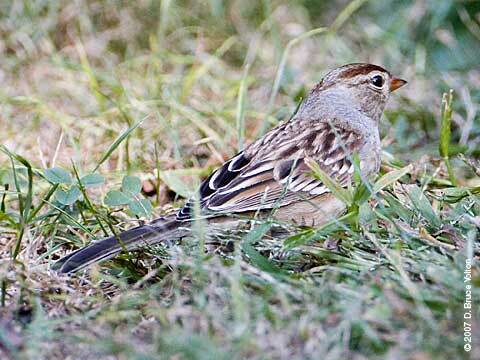 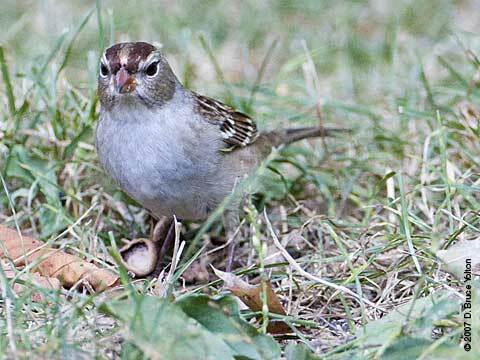 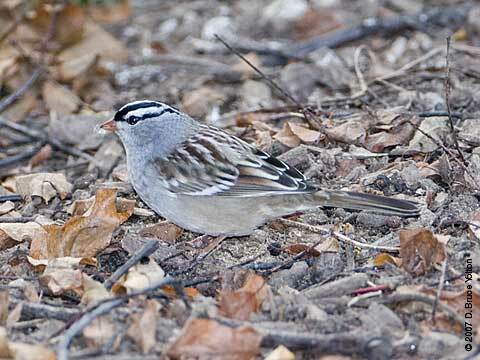 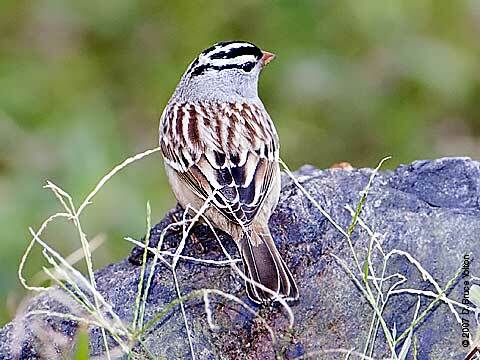 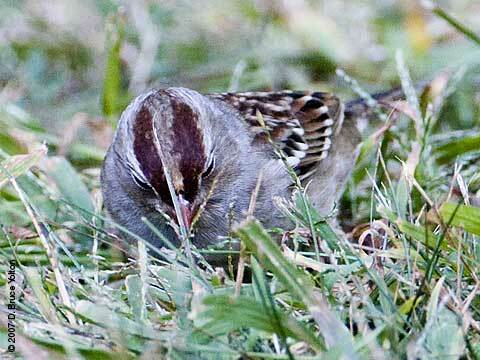 White-crowned Sparrow at Sparrow Rock. 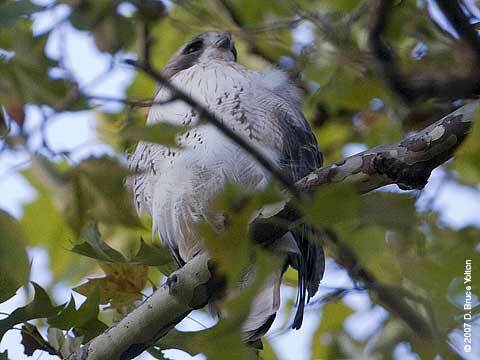 Pale Male in a tree on the west side of the Great Lawn. 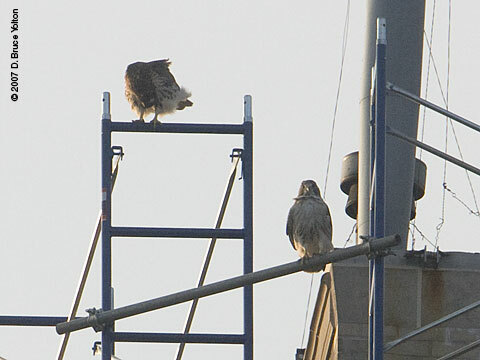 Early Sunday evening, Pale Male and Lola were on the Beresford. 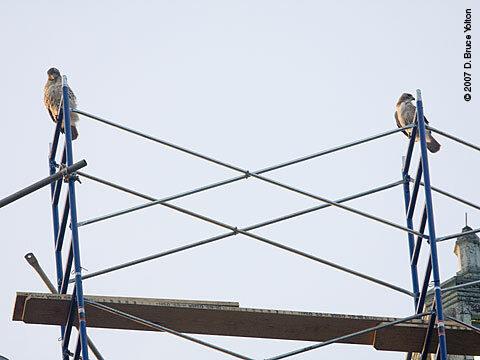 There is new scaffolding on the SE tower and they both seemed to be exploring the new perches. 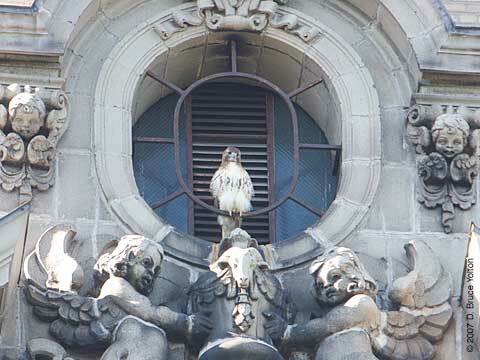 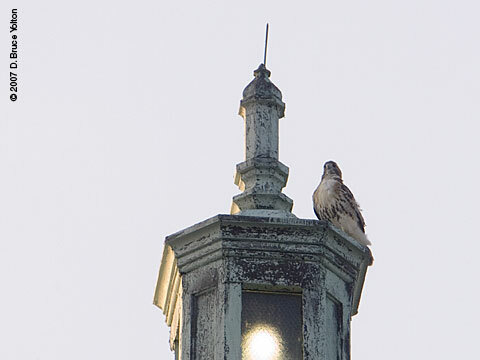 As it got dark, Lola moved to a favorite spot on the SE tower of the Beresford, and Pale Male moved to what has become his regular roosting spot. 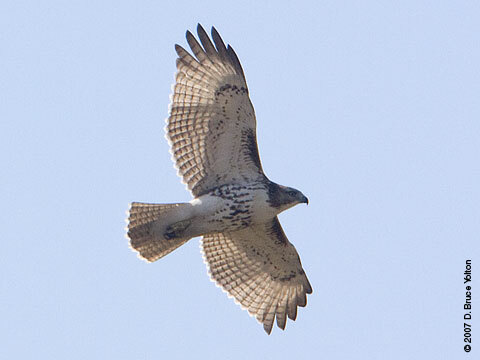 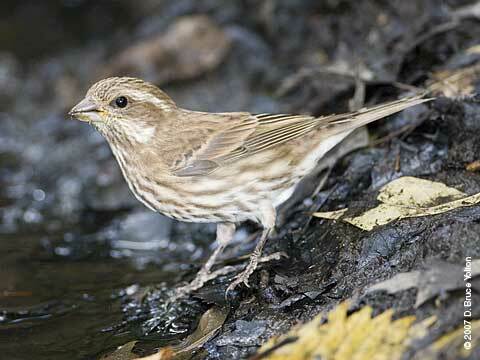 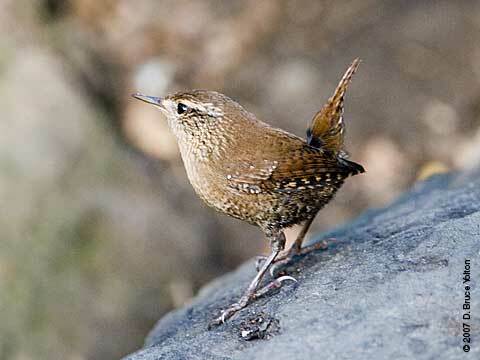 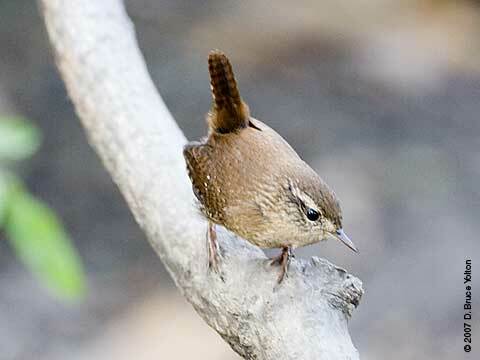 Sunday birding was fairly quiet in Central Park, but if you looked hard enough you could find some fun species. 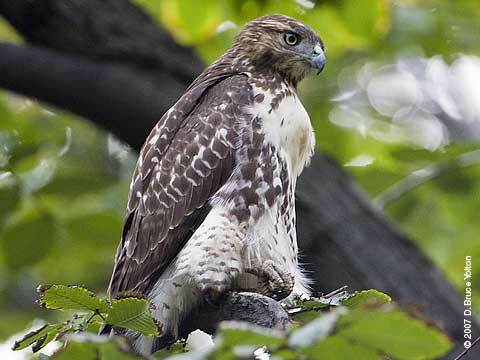 Both the male and female of the St. John the Divine Red-tailed Hawk pair kept an eye on the Falconry Extravaganza (a misnomer, since it is an educational event, rather than a true falconry event) on Sunday in the park. 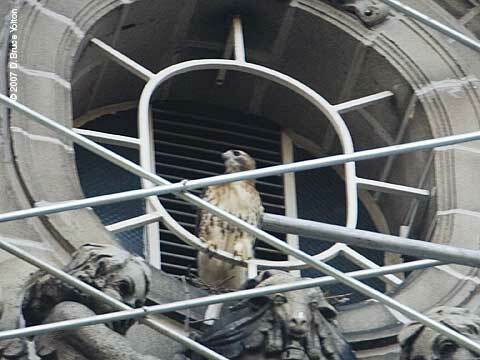 Here are pictures of the female keeping watch.